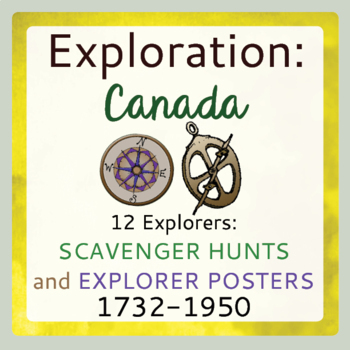 This resource includes 2 classroom scavenger hunts, posters (8 1/2 by 10”) of 12 explorers who made important contributions to the European discovery and settlement of what we now know of as Canada. They cover the time period of 1732-1950. There is also a set of the same posters, in half size. The latter might be useful for a center or even for a wall display if you prefer. Both sets of posters print out well in black and white. 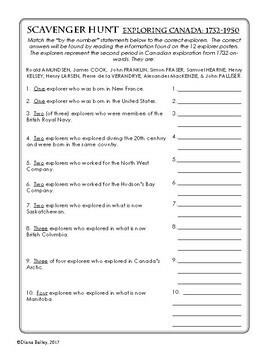 The explorers are: Roald Amundsen, James Cook, John Franklin, Simon Fraser, Samuel Hearne, Henry Kelsey, Henry Larsen, Pierre de la Verendrye, Alexander Mackenzie, John Palliser, David Thompson, and George Vancouver. To complete this activity students, in pairs or small groups, should first walk around the room and read each poster. If you have room, a duplicate set of posters can be displayed, perhaps one in the front of the room and one in the back. The smaller size of posters can be used, perhaps laminated and bound with a ring, or placed in a folder and used at specific desks or tables. The larger posters have different coloured borders and the smaller ones are all framed in a shade of dark grey. There are two scavenger hunts which can be done at different times. One asks students to find specific details found on the posters, the other is a “by the number” activity. 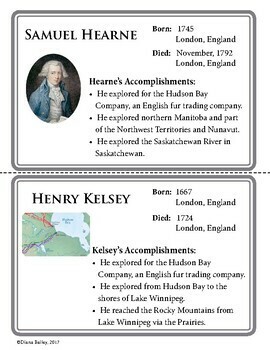 To complete the latter, students find one or more explorers that share common characteristics. Either of the activities could be done at any time during a unit on exploration. And of course, they can be printed back to back. 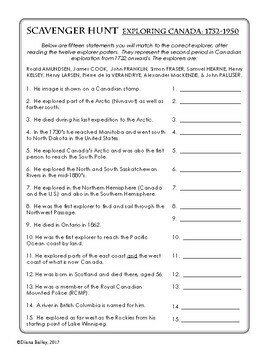 A full answer key is provided for both scavenger hunts. Please note I have chosen not to number any of the pages in this resource but there are a total of 4 pages for the scavenger hunts and 18 for the posters.